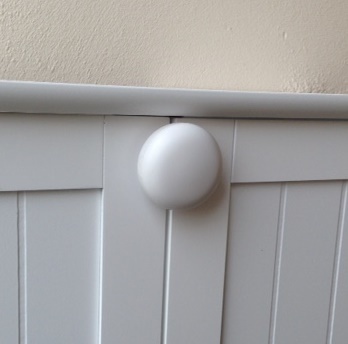 This is one of the simplest yet most cost effective cupboard locks on the market. It is designed to keep a double cupboard/drawer secure with just one simple device - a easy to fit bracket arrangement and the POP-IT lock head ® which fits onto the bracket. Depending on which version you purchase, release of the head is either via a key or push buttons on the head. 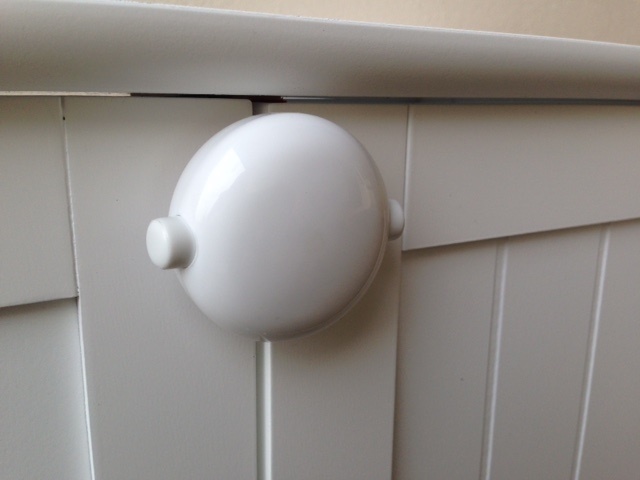 You should be aware that many so called 'cupboard locks' within the nursery sector are really only child resistant catches. Anything that releases the cupboard or drawer using just your finger is a 'catch' and as such, your child will eventually work out how to defeat it. A lock, offers an additional level of safety and security which cannot be matched by a catch alone. 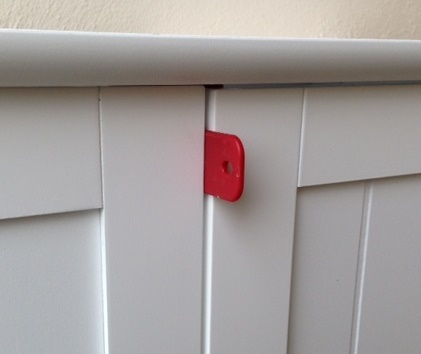 A range of brackets are supplied with your POP-IT Lock, to suit the construcion of your cupboards or drawers. If you have a central frame between the doors, the 'T' shaped brackets should be used. There are 4 to choose from, of different lengths, to enable you to ensure a snug fit with the thickness of your drawer or door panel. Your chosen bracket should be slipped into the mounting plate and the adhesive pad should be used to aid the initial positioning on the upright between the doors or drawer fronts. After confirming the location, secure the bracket with the wood srews provided. If you have no central upright, you will find an underslung bracket which can be secured to the underside of the frame or worktop, in a central position to the cupboard doors or drawers. Again, use the adhesive pad for initial location, and finally secure with the screws supplied. The POP-IT lock head is pushed on the bracket and clicks into position effectively securing your doors or drawers from prying fingers. 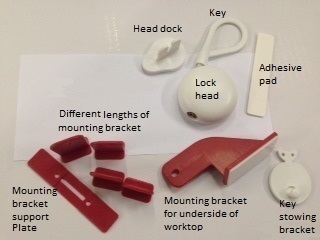 Release of the lock head is with a plastic key. Keeping this out of reach of children is critical for the lock to be effective. Included within the pack is an adhesive backed bracket for both the key and the lock head, allowing them to be stowed safely at high level when either item is not in use. The Push button release version. We also now offer a push button released device for use with really young children, or when levels of securrity may not need to be as high. The mounting of the brackets is identical to the Lock version and the head locates in the same way. The only difference is that release of the head is by squeezing a pair of spring loaded buttons either side of the head. Again, a stowing bracket is provided.